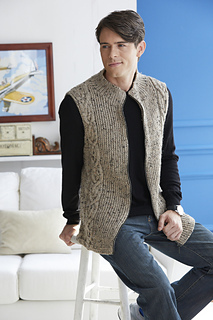 The combination of cable columns and half-twisted ribbing makes this zippered vest an instant classic. Plain k1, p1 rib forms the waistband and mock-neck collar. Double-layer plackets offer added structure to the fronts.